I spent the better part of my graduate school years professionalizing as a “nineteenth-century Americanist,” and more specifically as a scholar of Walt Whitman—a single-author specialization that’s not even Shakespeare! I knew that my role would change once I was hired at Graceland, scaled down by virtue of the intensive teaching responsibilities, but also more expansive and generalized in scope because of the wide-ranging foci of faculty at small liberal arts colleges. Moreover, I knew this job would require thoughtful consideration of pedagogical practices, a circumstance that sees many liberal arts professors move in the direction of disciplinary teaching scholarship. These various impulses from different spaces and moments of my scholarly identity–in tension at times–have nevertheless produced the meandering, but still often crossing paths I now find myself traveling as an early-career scholar. The most radical change in my scholarly interests since arriving on the tenure track has been my entry into the field of Open Education. As I have described elsewhere in my portfolio, after attending the Digital Pedagogy Lab institute, a week-long exploration of the role and application of digital technology in teaching, my career was reborn as an advocate for Open Educational Resources (OER), i.e., materials made free and available on the web to be accessed, downloaded, revised, and recirculated. By the time I had dropped in on the scholarly conversations about OER, the dialogue had evolved beyond advocacy for their adoption as learning content to sketching the larger contours of Open Education as a pedagogical principle. Over and above replacing expensive industry textbooks, OER proponents contemplate how the virtues inherent to open materials necessitate new kinds of teaching and learning, methods that embrace the open ethos to reuse, remix, revise, and redistribute in content and practice. David Wiley, for example, has challenged instructors to discard the “disposable” individual assignment in favor of collaborative and “renewable” open projects. Gardner Campbell recently called for an open pedagogy centered on producing insight, where educators turn design over to students, encouraging them to take responsibility for their own learning. This discourse spoke to me and my scholarship and teaching have evolved in refreshing new directions ever since. Two years ago, I redesigned my Early American Literature survey as an “Open” research-based seminar where students constructed a web-based OER anthology for future course sections. In the interim, I built relationships with various OER networks and publishers, and was named lead editor of the Open Anthology of Earlier American Literature , an OER textbook now in development with the Rebus Foundation—of which I was recently interviewed for Inside Higher Ed. In the Guide to Making Open Textbooks with Students, I published an essay on OER pedagogy in tandem with English major Matt Moore, who participated in the project’s first run, and his text received a reference in another IHE blog on the importance of student-faculty collaboration in the creation of OER. On Graceland’s campus, I led an introductory seminar on creating and teaching with OER and I continue to work with library and IT staff to build campus-wide support. At the 2018 MLA Convention, I presided over a roundtable with leading OER advocates, and I look forward to pursuing open scholarship to support Graceland students and my colleagues. While my research has started to move in the direction of more open, digital, and public forms of pedagogy, I’m trying to sustain an ambitious level of “traditional” scholarship as well. 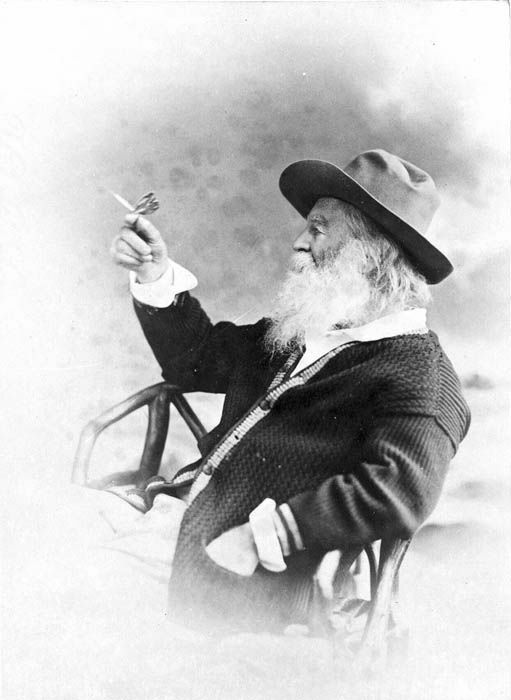 As a Presidential Fellow at the University of Iowa, my 2015 dissertation, Walt Whitman and the Making of the American Sociological Imagination examined the recirculation of Whitman’s Leaves of Grass among the foundational works of U.S. sociology at the turn of the twentieth century. In the process of reworking this project, I have presented papers at two conferences each year and managed to produce two forthcoming publications: a Walt Whitman Quarterly Review article “A ‘Reconstructed Sociology’: Democratic Vistas and the American Social Science Movement,” and the “Poetics of a New Science: ‘Song of Myself’ as Sociology,” a chapter in the Cambridge University Press Collection, The New Whitman. On the back of these efforts, I aim to submit a book proposal to the University of Iowa Press for their Walt Whitman Series this summer. While I recognize that a scholarly monograph is beyond the call of Graceland’s scholarship requirements—and will prove time and labor intensive—I figure the timing to pursue such a project will never be more right than right now. Additionally, I’ve started envisioning another long-term literary research project: on the reception of U.S. literary “race traitors” (e.g., John Brown, Huck Finn, Wendell Phillips) in the activist ephemera of late 20th-early 21st century anti-racist groups (like Prairie Fire, John Brown Anti-Klan Committee, Race Traitor, Redneck Revolt.) I will be presenting a paper on John Brown’s presence in the literature of such groups at the 2018 American Literature Association conference in San Francisco in May.